Over 200 new immigrants to fly from NY to Israel, including dozens of lone soldiers. Enlistment in the IDF is a significant and exciting milestone for 18-year-old Israeli teenagers. They leave their homes and their parents to enter the rigid framework of military discipline, which every year challenges tens of thousands of young Israelis to be the best that they can be. While enlistment in the IDF is challenging for native-born Israelis, who have lived in Israel their entire lives and enlist at the same time as their friends, olim (immigrants) who enlist face their own challenges when joining the IDF. 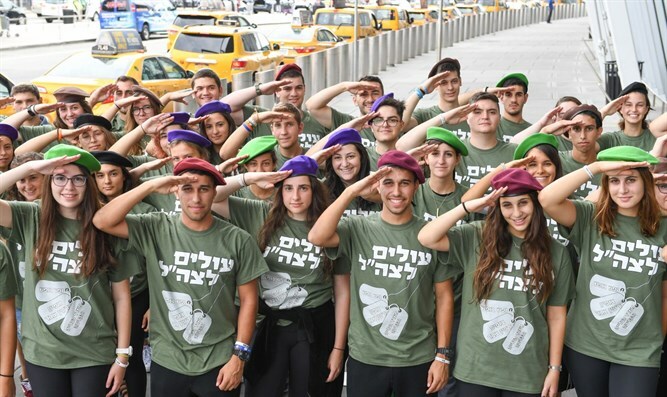 About 70 young men and women from the US are taking this step and will fly from JFK Airport in New York to Ben Gurion Airport Israel to join the Israeli army. In the coming months, they are expected to enlist in various units in the IDF and join the 3,000 lone soldiers currently serving in the IDF. The new soldiers are part of a flight of 233 new immigrants who will fly from New York to Israel Monday as part of a special immigration flight of the Nefesh B'Nefesh organization. The flight was facilitated in cooperation with Keren Kayemeth Le’Israel, Israel’s Ministry of Aliyah &amp; Integration, the Jewish Agency for Israel, JNF-USA and Tzofim-Garin Tzabar. The immigrants will arrive in their new home Tuesday morning. The landing will be broadcast live on Arutz Sheva. Approximately 2,000 new immigrants have moved to Israel from the US and Canada this summer.